Sea turtles are among some of the most difficult animals to study. They cover wide ranges, usually spending some time foraging and mating at sea and then migrating to beaches to nest. This migration is a journey back to the female's natal beach, which is the beach where she hatched. Sometimes this journey is a few hundred miles, but leather back turtles can exceed 3,700 miles! Sometimes, researchers use tagging methods to study them but there is a great deal of information that we simply do not know. 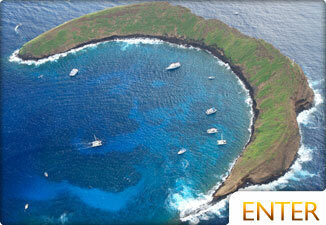 Take a trip on a snorkel boat with experts that know where the largest current congregation of turtles can be found. This is often referred to as Turtle Town, but it's a shifting place that exists in many locations. 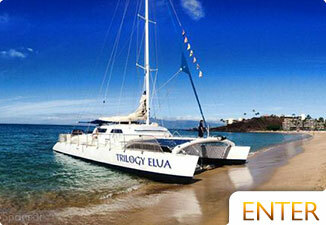 Call 1-800-736-5740 to book seats on the Four Winds II, one of the finest boast in Hawaiian Waters. Their afternoon trip will take you to Coral Gardens, a difficult to access area of coastline with rich living reef and plenty of turtles. 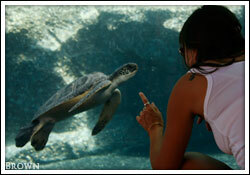 The Maui Ocean Center has plenty of sea turtles of which you can see from above and below the water's surface. You'll meet ocean naturalists of whom are well-versed in the 5 species of sea turtle found in Hawaii. Everyday there are different events where naturalists walk you through the lives of these beautiful and graceful creatures as well as answer all your questions. Call today to find out more and buy tickets at (808) 270-7000. Below are the seven species of sea turtles that are currently known to exist, five of which can be seen in Hawaiian Waters. At 7 feet (2 meters) long and over 2,000 pounds (900 Kg), it is the largest sea turtle. It as a unique shell that does not have bony plates, but rather a single rubbery carapace which is flexible to help accommodate the pressure of deep dives. Also, there are 5 ridges running the long way on the shell helping to promote efficiency when swimming. This species has been documented diving as deep as 4,200 feet (1,280 meters) and can remain under water for 85 minutes. These turtles spend most of their time out in the open ocean and are consequently not often seen by people. At approximately 4 feet (1.2 meters) long and about 400 pounds (181 kg) they are the largest hard-shelled sea turtles and are easily found in the shallow coastal waters of Hawaii. Look for a smooth edge around their shell and a rounded beak. As juveniles they are carnivorous, but as they become mature, their diet changes to vegetarian, consisting of primarily algae and sea greases. Although a few of these turtles will nest in the main Hawaiian Islands, most nest in the northwest Hawaiian Islands. At 3 feet (nearly a meter) and and over 300 pounds (136 kg), they are one of the largest hard-shelled sea turtles. Loggerhead turtles have a noticeably large head and thick neck. They are mostly carnivorous, feeding on crabs, sea jellies, and sponges. This turtle is the most abundant sea turtle in the USA, and although these turtles have been seen hanging out occasionally in Hawaii, they are the most common turtle to nest in Florida. 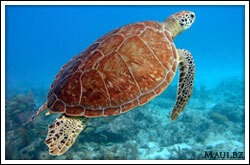 At just under 3 feet (83 cm) long and 150 pounds (96 Kg), they can be confused for a small green sea turtle. The most obvious identifying characteristic of this species is the "hawk-like" beak they have. They also have a serrated edge or their shell unlike the green sea turtle. They prefer coastal waters near their nesting beaches and avoid deep waters. These turtles are omnivorous and feed mainly on sponges, algae, crustaceans, sea urchins, sea jellies, and fish. This turtle species is the second most commonly seen turtle in Hawaii. This is a small turtle with a length of only 2 feet (60 cm) and a weight of 100 pounds (45 kg). As its name indicates, the body has a darker green or even olive coloring with the greatest number of scutes of any sea turtle. When migrating between the feeding and breeding areas, the Olive Ridley can be seen in large groups. otherwise, it is known to be solitary. The feed on sea jellies, crabs, shrimp, snails, and occasionally algae. At approximately 2 feet (60 cm) long and up to 100 pounds (45 kg) this is the smallest of the sea turtles. Their diet consists mostly of crab but they will also hunt sea jellies, fish and sometimes graze on seaweed. They are primarily found in the shallow, muddy, coastal waters and migrate to Mexico. Not found in Hawaii. This turtle is approximately 3 feet (about 1 meter) in length and weighs over 190 pounds (85 kg). Very little is known about this turtle and it is not understood just how many may their be in the wild. We do know that they hunt squid, mollusks, corals and sea cucumbers. They are not found in Hawaii. 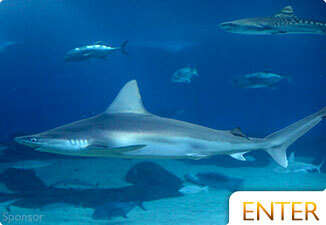 An excellent way to see these magnificent creatures is with Pride of Maui on a snorkeling trip or snuba diving trip. Not enough people know about the advantages that snuba gives those looking to spend more time underwater. Snorkeling is great, but if you want to go one step further (but don't have time to get scuba certified), this is your chance! Learn more about Snuba Diving. 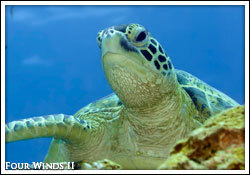 The above information about turtles is being used courtesy of the Maui Ocean Center. Most photos by Natalie Brown Photography. 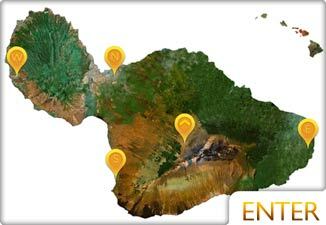 See custom maps of the best snorkeling spots around Maui.